Who is The Million Dollar Man? Over 3 billion dollars sold and averaging over 500 million dollars a year in real estate sales, Josh Altman is recognized as one of the most successful and powerful agents nationwide and around the world. Due to his success, Josh was offered a starring role on Bravo’s “Million Dollar Listing." While Josh earned distinguished recognition for his wealth of knowledge, expertise in negotiating and remarkable results, he positioned himself as one of the most well-respected and sought after agents in the real estate business. Besides shattering records as a Realtor with Douglas Elliman, where he consistently ranks in the top 1% in sales, Josh also constantly invests in real estate and flips houses on his off time. 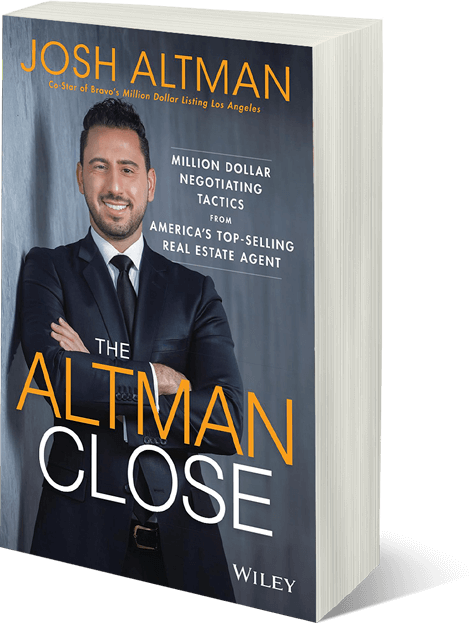 Josh Altman knows the real estate business inside and out and can teach you how to take your business to the next level – and beyond. Take an exclusive bus tour with Josh Altman as he showcases some of Los Angeles most prestigious properties. Take notes as Josh narrates his experience on locking down some of the most expensive properties on the west coast! Enjoy an intimate Q&A dining experience with Josh Altman in one of Beverly Hills most exclusive restaurants.